The recent International Boreal Forest Research Association conference held in Edmonton provided the Canadian Wood Fibre Centre (CWFC) with an opportunity to co-host a pre-conference tour for 50 attendees to visit and discuss issues related to land-use pressures on the Boreal Plains forest, using Alberta as an example. “The primary focus of the tour was to look at forest land that is being disturbed by a variety of different sources and the implications as it relates to long term risks and sustainability,” says Derek Sidders, CWFC Regional Coordinator for the Prairies and tour organizer. Partnering with CWFC on the tour were the University of Alberta, the Canadian Forest Service, and forestry company Vanderwell Contractors (1971) Ltd.
About 75 per cent of tour attendees were from Europe, with the remainder from North America. Most were academics conducting research related to the boreal forest in their particular jurisdictions. By touring and evaluating various forms of land-use disturbance, Sidders says the goal was to advance the discussion within academic circles on issues related to sustaining and where required, rehabilitating the boreal forest. He says it provided conference participants with a pre-conference baseline and field perspective of the impact, scale, and range of different users on the land base specific to the agriculture/parkland-boreal forest interface. It also provided them with a field perspective on stand configurations, disturbance types, and potential impacts and opportunities that exist related to long term sustainability, “and, of course, the issue of risk in the boreal forest”, said Sidders. Several of the stops used a catastrophic wild fire that impacted resource industries in Alberta economically as well as from the sustainability perspective, due to the disturbance impact. The various sites visited were within the 118,000 hectare, Chisholm fire southeast of Slave Lake, which occurred in 2001. “It was started as a result of all this infrastructure and various land-uses within the forest, so it was man-made,” says Sidders. “Millions and millions of dollars of infrastructure were impacted, as well as over $4.5 million of standing timber lost due to that fire.” Tour participants considered several Canadian Forest Service studies that evolved from that fire related to fibre salvage and forest recovery. Other stops featured sites logged by forest companies and regenerated using various means, as well as discussion of research studies focused on mixed wood dynamics within those logged areas. Others featured viewing of well and mill sites as well as oil and gas infrastructure, featuring a pipeline that transports 180,000 barrels of Alberta’s oil to market daily. “There are major implications obviously associated with oil and gas extraction, infrastructure, and transporting and conditioning of the material, and of course the exploratory impacts associated with exploratory wells, seismic lines, and so on,” says Sidders. 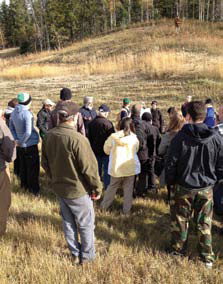 Tour participants looked at various approaches and results from reclamation activity on different sites where forest disturbance has occurred due to oil and gas activity, including response on heavily compacted sites. For more information about this pre-conference tour and the studies evaluated during the tour, contact Derek Sidders at (780) 435-7355 or Derek.Sidders@nrcan.gc.ca. Considerable progress has been made on the Alberta Innovates Bio Solutions (AI Bio) funded development of an easy-to-use, web-based system that will identify all potential available sources of forestry and agriculture biomass in the province. Once available, it could stimulate development of new bio-industrial projects that depend on a reliable source of biomass feedstock. Called the BioResource Information Management System—or BRIMS for short—the tool will be unique in the world and has completed the proof-of-concept stage. The project team is now working on a long-term business model, which will require the support of additional investment partners and formalized data-sharing agreements. The data provided by BRIMS is intended to quantify both forestry and agriculture biomass amounts, determine its availability, and pinpoint its geographic location, using current information from a variety of stakeholders, including forest companies. The goal of the BRIMS project is also to identify information gaps, improve upon the quality of the information data and then present it to the world. Given the progress made so far, BRIMS is expected to be available within the next two years. He adds that having access to a tool like BRIMS is critical to AI Bio fulfilling its mandate, which is to work toward advancing the bio-economy in the province. Advances in technology also made development of a service like BRIMS possible. AI Bio hired the Silvacom Group in 2011 to initiate the project. The first phase involved several components, including a thorough evaluation of the current state of science and data associated with biomass assessments. It consisted of a comprehensive literature review and jurisdictional scan of over 30 countries. 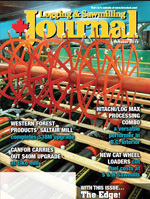 This review concluded that, “no one has designed a comprehensive biomass measuring system that covers all biomass sources and components, including drawing together data from the green (forestry) and white (agriculture) zones.” In other words, what is being developed in Alberta will be a global first. 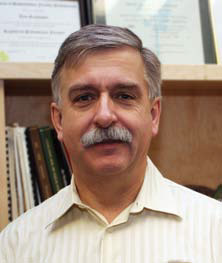 Tom Grabowski, president and chief executive officer of Silvacom (above), says that a major breakthrough during the first phase of BRIMS development was the integration of information from new and previously unavailable sources of biomass resulting from data-sharing agreements signed with key stakeholders in the forestry and agricultural sectors. With access to this information, Silvacom was able to create and compile unique biomass data sets that are far more complete and detailed than anything currently available. The second phase involves development of an online system where BRIMS data is accessed and analyzed to answer critical biomass availability questions for potential investors. The result will be ‘Prospectus Generator’, which Silvacom describes as an innovative approach to online management and distribution of geospatial biomass data contained in BRIMS. The concept is to provide an easy-to-use, web-based portal to make it possible to display potential biomass from a variety of sources and user-defined areas. The functionality of Prospectus Generator includes organization and storage of the acquired biomass data as well as online tools to display and analyze opportunity scenarios for forestry and agriculture biomass supply from user-defined areas. The information will be made available on a township, regional, and provincial scale. So far, pre-build wireframes of the Prospectus Generator have been designed. He adds that with BRIMS, Alberta is also creating a potentially marketable product. “We think it will be a model that could be exported and used in other jurisdictions to build out biomass inventories and provide analytical tools for evaluating investment opportunities in other areas,” Grabowski says. The forest has many under-utilized resources that if harvested in a sustainable way —and marketed to the right audience—could provide additional income to Alberta woodlot owners and landowners interested in agroforestry. Through the Growing Forward 2 program, the Alberta and Canadian governments have partnered to provide financial support on a cost-shared basis to help individuals investigate and launch potential business ventures related to value-added and specialty products from the forest. Financial support to help develop marketing strategies for these products is also available. Bozic adds that the Growing Forward 2 program can help eligible applicants with endeavors such as feasibility studies for new opportunities, business plans for expansion and restructuring, market research, value chain development, pricing models, marketing plans, business management mentoring or coaching, and succession plans. Funding is also available for business management skills development. One company that has already recognized the value of what nature has provided in the forest is Untamed Feast (www.untamedfeast.com). Owned by Eric and Michelle Whitehead, a young couple from St. Albert, Alberta, the company markets edible and select gourmet wild mushroom and mushroom-based products harvested from the forest throughout Western Canada and the Northwest Territories. It has been operating for 13 years, with their product in retail stores for the past six years. The largest part of their business is selling highly sought-after morel mushrooms. In 2013, their entire morel mushroom harvest came exclusively from Alberta forests. It is sold as a dried food product. Michelle says a key part of their marketing strategy is emphasizing that the mushrooms are not a cultivated crop but wild mushrooms, which she says makes a difference in their nutrient content, flavor and aroma. They are also a non-cultivatable crop. 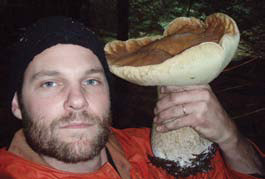 Eric is an expert in mushroom varieties and a certified herbalist. He spends considerable time in the forest picking the crop. The company’s product line has expanded to include other wild mushrooms such as dried, smoked, and aged chanterelles, dried porcinis, and a forest blend consisting of several edible mushroom varieties. They also sell mushroom-based products such as mushroom gravy, porcini risotto, wild mushroom soup, morel coconut rice, and chanterelle arroz. She adds that the business has expanded more than they expected, and their vision has grown dramatically. They sell their products both directly, such as through Farmer’s Markets, and over the Internet. Michelle says their strategy is to try to build local markets for their products with home cooks as well as with gourmet cooks. All of their products come with recipes and their web site has cooking demonstrations and mushroom hunting videos. For more information about the Growing Forward 2 program, visit http://www.growingforward.alberta.ca, or contact Toso Bozic at toso.bozic@gov.ab.ca.